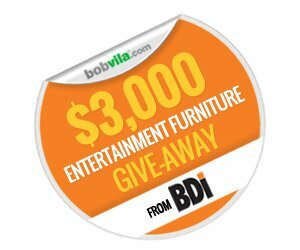 Enter to Win Bob Vila’s $3,000 Entertainment Furniture Give-Away—TODAY! When you get the itch to catch the latest movie or celebrate over cocktails, do you head to your own living room? Probably not! But with the right amenities, your living room could become the ultimate destination for family and friends. After all, why go out for a night on the town when your house boasts the best in home entertainment? That’s why we’ve partnered with BDI, offering a give-away that could transform your home into a haven for fun and relaxation. The winner of our sweepstakes will receive a prize of $3,000 worth of furniture—your choice of a home theater cabinet or a stunning minibar! BDI, a leader in contemporary furnishings, is a company with a mission to make great design accessible to everyone. Their passion for incredible home design is reflected in each piece of furniture they create—right down to the packaging that ensures your new collection reaches you in optimum condition. Not only that, but their unique home theater furnishings are as striking as they are functional. Engineered for today’s technologies, the Corridor® 8179 home theater cabinet features four compartments that accommodate a range of speaker sizes, players, and accessories. 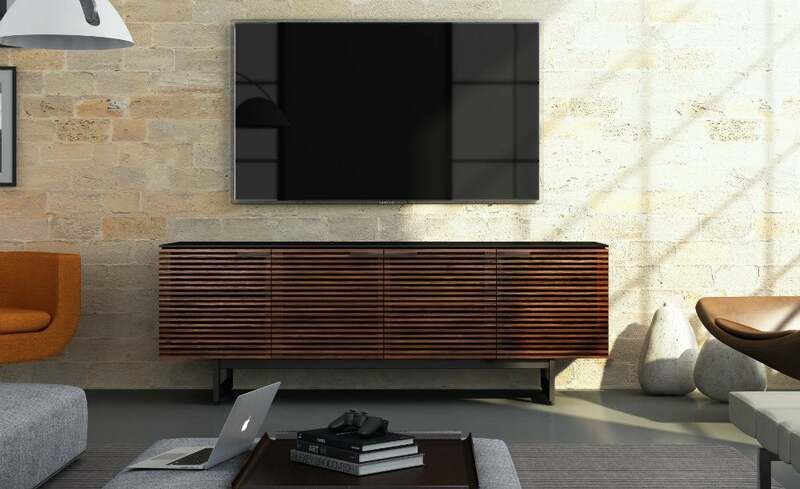 Doors finished in solid walnut or solid oak allow speaker sound and remote signal access to pass through unobstructed, while hidden wheels at the bottom of the cabinet legs let you to move it away from the wall for easy access to cables and connections. The roomy Corridor® Bar features a 12-bottle wine rack, in-door storage for liquor and liqueurs, a wooden stemware rack for glasses and shelves to keep tumblers, mixers, and bar accessories within easy reach. 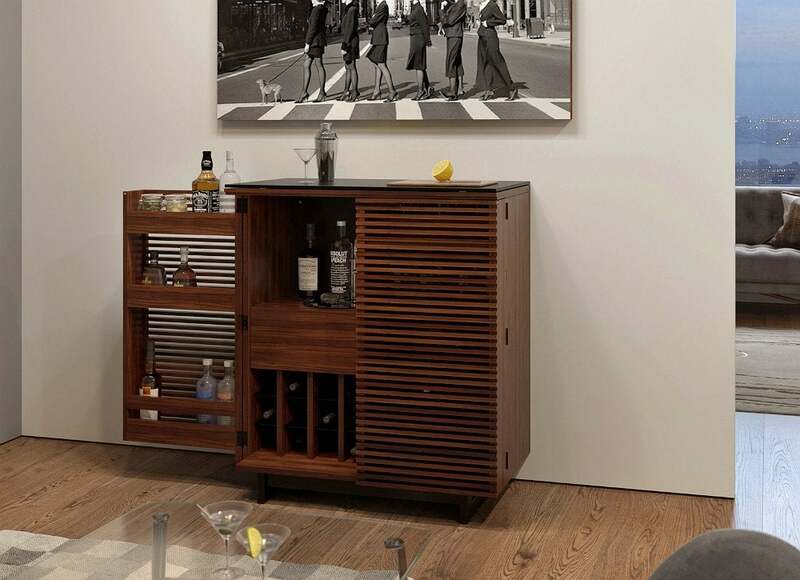 Everything is concealed behind two louvered doors—the signature design element of the Corridor® collection—while the black, micro-etched glass top provides an ideal place for mixing and serving drinks. ENTER TODAY to win your choice of Corridor® entertainment furniture from BDI today and every day this month! Bob Vila’s Give-Away is open only to permanent legal U.S. residents of all 50 states and the District of Columbia. Void in all other geographic locations. No purchase necessary. Void where prohibited. The Contest Period will begin noon EST Saturday, January 31, 2015 through 11:59 a.m. EST Monday, February 14, 2015. One entry per household per day on BobVila.com. Alternative means of entry for Drawing is available by faxing your name and address to 508-437-8486 during the applicable Entry Period. Odds of winning depend on the number of eligible entries received. By entering, all entrants agree to the Official Rules.